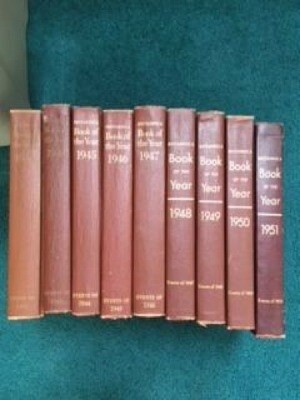 I have 9 Britannica book of the year copies. 1943-1951 in pretty good condition. I am wondering if they are worth anything? I am interested in 1943 because it was my birth year (1942). Would you like to sell it? When you are doing your search you will need to look for an apples to apples match to find your EXACT books--meaning for each book, the exact book, year, condition and see if they sold and what the selling price was. Someone may have them as "set" or "lot" but it must match exactly what you have in front of you to help you determine a value. If you use something similar you are not going to get an exact value as sometimes there are similar items where one has a lot of value and the similar none...so if there are no sold listing for your exact book (books) keep checking back. You may want to see if there is an exact match in the active auctions and set up an eBay WATCH to see when/if it sells and for how much. If there are multiple exact items sold for different prices, I usually do an average to help me value my items I sell. I recommend ONLY using sold price not using current auctions and asking price as people can ask the world, but value is only what people will pay. When trying to determine your selling price (value), I use the price people paid PLUS shipping (which I know a lot of people disagree with me about) because if you are selling them at a face to face venue, it is helpful to know the EXACT amount someone forked over for an item when setting your price. So, if someone paid $100 with free shipping (you could value the item at 100). If someone paid 50 for an item and 50 for shipping, same thing (50 + 50 = 100). The thing with VALUE is it is TOTALLY DIFFERENT THAN PROFIT. Meaning in the eBay example, if the item sold for $100 with free shipping, the seller only netted (and I am using round numbers for reference only) less than 50 because shipping something this heavy is expensive in that case is paid by the SELLER, plus the eBay and Paypal fees are paid by the seller also. The same less than $50 value is evident when the BUYER pays shipping (the seller can't count shipping as profit because even though the buyer paid for it, the seller spends it to get it to the buyer--but it can be counted as item value if selling in a face to face venue where no shipping is involved. The seller still pays fees here also so that is a wash. Condition is everything, so if someone is selling a pristine book and it sold for $100, a less than pristine book would go for anywhere from 15-20% less...or even more if the condition is really bad. Also, be aware that calculating a value (asking price) can be calculated by adding each sold price up to get a value (like if one sold for 1 and the others for 2, and you have 10 books to sell (9 x 2 is 18 +1) it would be a value of 19 dollars to start. Hope this helps you determine value for your books! Good luck! Thank you for taking the time to help me. Its seems like a lot of great information that I can use. I really appreciate it. Thanks, again. Year books will sometimes sell better/faster if listed individually as people do look for a certain year more than they look for several years together. Year books make great birthday gifts especially from this many years ago. 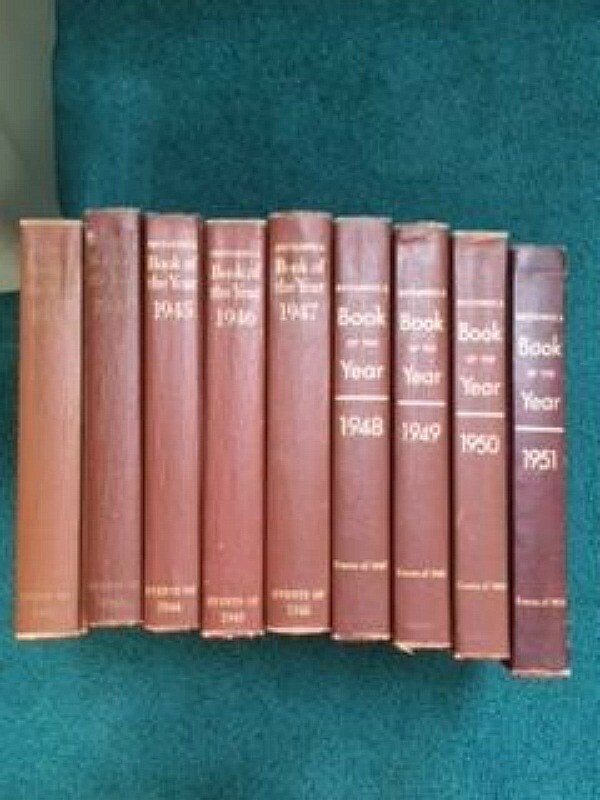 There are sites to check for any of your year books - eBay, Amazon, Abe's Books, Google - but you may not find any listings with all these years. Abe's Books sell a lot of individual books (usually about $9 each) but I do not know what fees they charge. eBay and Amazon also have individual books listed and they list for about the same amount - $9-$10 each - but they both charge about 10-13% of the sale price as fees. Most all books of this sort are very slow sellers and it may take many months for your books to sell (if they sell) so that is something to think about. If your 1943 book has anything about WWII it may be more valuable - especially if it has pictures. Check this out before listing. You can list on eBay, Amazon, Bonanza but it is really easy to list on your local sale sites like Craigslist, USA4Sale, Facebook Marketplace and there is no shipping involved. If these were my books I would list on local sites first. List as a lot with a $60-$70 (maybe negotiable) price and state individual years sold for $10 each. All you have to do if one year sells is remove it from the lot, adjust the price and wait for another sale. Hope you have good luck - these are interesting books.